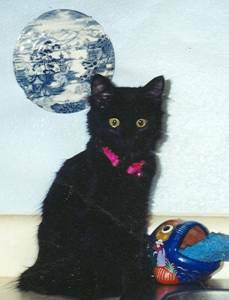 This site is dedicated to my beloved girls, Squeak, who crossed the Rainbow Bridge on September 1, 2004..and Miss Kitty, who just recently crossed the Bridge on June 24, 2005. 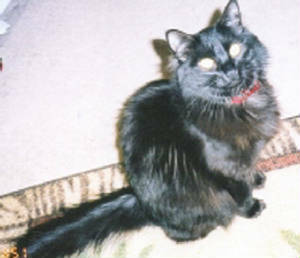 Squeak came into my life on December 13th, 2003, after some searching for another cat. We had visited the local shelter first, where they did have kittens...but none of which that I felt connected to. Feeling let down, I left...and called another place, which they didn't have any kittens at the time. 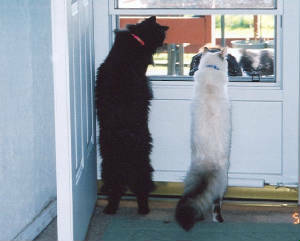 I don't know why exactly that day I was so determined to get my cat, I just had this feeling...one is out there. While in the car waiting, I called another pet store, and BINGO! They said they had 4 siamese mix kittens. At that point, I was anxious...and had a very weird feeling that this place perhaps held my next furbaby. I had my heart set on another female, so when I got there and went straight to where the cats usually are...my heart felt like it stopped. Inside were the 4 most beautiful little kittens I've ever seen. 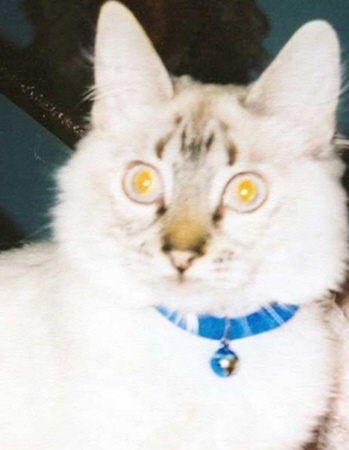 2 were white with silver and brown markings, while the other 2 were tabby striped. At once, one of the little white ones caught my eye, and I asked if it was available. They all were, and also, it was a female! I held her, and I knew.....This Is The One. It was one of those moments that should have been in a corny movie..she looked up at me with those big, beautiful blue eyes and I instantly loved her. It turns out that her and her siblings were brought in at a way too young age, so the pet store had to hold them for a while until they were of age. They named her and her twin Bonnie and Clyde, but she was meant to be a Squeak! When she was brought home, I had the toughest time thinking of a name for her! First was thinking of Siam...as in Siamese, but it just didn't stick. However at one point, she looked at me and let out a little "eek". I cried- she was just too cute! From that moment on, her name was to be Squeak. The Squeakers..Squeakerdoodles, Squeaks-A-Lot, Freaky Squeaky, The Squeakster. Yes..she had a lot of names. Squeak saved me at a time where I really wasn't myself...she brought out the best in me, and I her. She wouldn't let anyone else pet her, and if they dared..she'd look at them and move. She loved to cuddle on my bed, play with dangly toys, and bask in the sunlight. Around 8 months or so, she began to sleep a lot more....First I thought she was just going through a phase, and since it was so hot outside this past summer, I thought that must be it. However when my other cat would play still, I knew something was up. On August 13th, 2004 I became a Mommy again to a pomeranian puppy named Bear. I didn't let him near Squeak....I knew that there was something wrong with her, as she didn't seem any better. When he went for his vet check up, I scheduled an appointment at the same time for Squeak too. There...my worst fears were confirmed. She was diagnosed as anemic, which should be treatable. She had a fever, and was dehydrated. They gave me some meds for the anemia, and some anti-biotics for the rest. The meds smelled AWFUL, and the expression on her face when it was time for them was heartbreaking. She'd get the anti-biotics twice a day. I was so mad at myself, for waiting so long...what would the outcome be if I got her to the vet sooner? I wasn't expecting a miracle on the first day, but then...things just got worse. On August 30, 2004 I took her to the emergency vet. They told me she might not last the night. They took some more blood from her, which was difficult...as they and my regular vet had trouble finding a vein which to do so. They said that a blood transfusion might become necessary, but wouldn't mean it would work for her. The vets had told me that she also showed signs of neurologic problems, as her eyes seemed to be out of focus, and her head would kinda go off to one side. To this day, I still have no idea just exactly was wrong with my little girl. The vet agrees that it most likely was FIP, which is Feline Infectious Peritonitis. 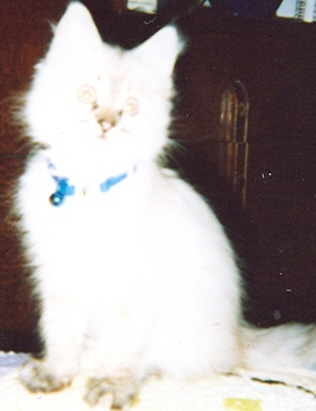 That is a fatal cat disease, in the groups with FIV, and FeLV..
On September 1, 2004, I made the hardest choice of my life. Her last night, I put a towel down on my bed and just held her.... she was taken to the vets in the evening, and was given an anesthetic. It was over fast....and finally she was in peace. My beautiful baby crossed the Rainbow Bridge sometime after 6 p.m. At that moment, a part of my heart was gone. "I have sent you on a journey to a land free from pain, not because I did not love you...but because I loved you too much to force you to stay"
To have you back as mine…..
My beautiful Miss Kitty, our familys first cat...the Queen of the house, always Queen of our hearts. She came into our lives in September of '02, a tiny little black kitten from a dingy pet store in Eagle River. I have always appreciated everything to do with cats, always wanting one. Finally, she was there. She was and continues to be my teacher, my guiding 'paw' to light....she was the sunshine on a cloudy day, so easily able to bring a smile through any tears. She was aloof, usually perferring to reign her kingdom from on top of somewhere high, where she had perfect view of everything happening. However she also was incredibly loving, so willing to share a cuddle when needed most, somehow telling you she understood, and was there. When I lost Squeak, she let me hold her and cry, ignoring the fact her beautiful fur coat was being soaked by tears. In January of 2005, she began to vomit more than normal. It started with hairballs, then ended up only being food. She would vomit sometimes twice a day, for days on end. When we took her to the vet, she seemed normal, and it was classified as a food allergy. However at one point, she began doing it about three or four times daily, and we took her to the emergency vet where she had a temperature and was getting dehydrated. She stayed overnight, while we worried away at home, but knew she'd be ok. When we took her back to our regular vets, we decided to try Science Diet Prescription Z/D to see if it would help. It did for a while, and for precious glorious weeks she went vomit free except for an occasional hairball, and seemed fine. Then....it went extremely downhill. About Thursday, June 16, 2005 she was vomitting 6+ daily. She wouldn't eat, wouldn't drink, and hid in various places she never would hide before. We took her in on Saturday, figuring a steroid shot would help as it had before in the earlier months, but she became even worse. We were also given some anti vomitting medicine for her, but couldn't even get it down her throat because she would spit it back out. We took her back to the Emergency vets on Sunday afternoon, where she yet again was found EXTREMELY dehydrated, even with subq fluids being given, losing weight, and a low temperature. They decided to keep her till Tuesday, where she would be given fluids and checked to make sure she wasn't vomitting anymore. They also did xrays, and a full blood panel work to check for certain bugs, and her organ functions. The xrays showed nothing abnormal, however her blood results came back with elevated kidney levels. They were treating her for the dehydrated, and kidney disease though it wasn't exactly known yet if she DID have kidney disease...the levels could have possibly been elevated because of the dehydration. She stayed Sunday through Tuesday there, where she didn't vomit again (however she refused to eat still) and seemed to be more alert after being given the fluids. We brought her home, and took her to our regular vet where he also checked her results and xrays for his opinion. We decided to bring her back the next day for blood work, to make sure she wasn't in kidney failure. Well...Thursday we got the results back, and SHE WAS. He wouldn't get to the point at first, he spent a while explaining the levels and what they meant....then I flat out asked him if she was in kidney failure. He went quiet, and whispered yes. God, my heart broke. He said we could do 3 things: 1. Euthanasia, 2. Wait, then do Euthanasia, 3. Try and treat it, but it would be in vain...she was suffering horribly and this point, and they couldn't do anything for her. I decided we needed one more day with her...we just couldn't let her go that day Thursday. Friday was a beautiful sunny day, the complete opposite to how we felt. It should have been rainy and miserable, how could there be any happiness when Miss Kitty was dying?? I let her be outside, for she truely loved being there....she sniffed the grass, prowled around and enjoyed the peace of it all. We brought her in about 4 pm, and waited for about 30 minutes before the vet was available. As with Squeak, it was over fast...she put up no struggle, too weak to do so...and I'm sure she was thankful and happy to go, for Miss Kitty was a completely dignified and regal cat, who certainly wasn't herself when she was weak as she was, and so lethargic. I held her in my arms, telling her it was ok...we loved her so much, and she'd have Squeaky and all her new Bridge Friends there to keep her company till we can be together. Sweet Miss Kitty....we love you with all our hearts, and miss you so. Thank you for the memories, for unconditionally loving us and sharing your life with us. Thank you for the almost 3 wonderful years we shared, they were a blessing and with you and Squeak...the best 3 years of my life. Godspeed, my good girl...until we meet again. Cats leave paw prints all across our hearts…. In Loving Memory of Squeak. Thanks to my friends who made such beautiful dedications to both my girls...you are amazing!